to hold two burette, made of metal, die prassed, with built in boss head oxidised. Carewell Cork borer is made of nickle plates and well chromed. Cutting tube mounted with safety under-flange in shaped handle ensuring that operator cannot be injured by a dislodged tube. With iron rod for cleaning borers. For boring straight and uniform holes in cork or rubber stoppers. Cast iron frame with platform to support stopper, 4 holes for fixing to bench top. Complete with a set of 12 nickel plated steel borers, cutting sizes from 7 mm to 25 mm. 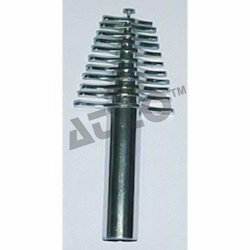 With cork borer set of 12 and an ejector, hand operated with screw type shaft. with set of 12 nickel-plated borers cutting sizes from 7 to 25 mm. The equipments for chemistry lab are made using latest technology& standards these equipment ensures complete reliability in its operations. We can provide a wide range of equipment to support our customers need. A set of 12 steel borers to drill holes of 3mm to 25mm diameter. 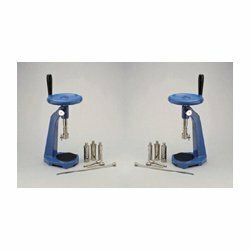 Our cork borer is made of brass with Chrome plated of various size tubes, each with cutting edge at bottom and handle at top, with cleaning rod. - Set of 6 borers, 4-12 mm. - Set of 12 borers, 4-19 mm. Hand driven, for boring straight and uniform holes in cork or rubber stoppers. Cast iron frame baked enamel finish with wooden platform to support stopper. Base has four holes for mounting on table or bench top. The spindle has a center hole through which passes the cleaning rod.